The camp of Nigeria’s Super Eagles has come alive in Victoria, Mahé Island in Seychelles following the arrival of six more players on Tuesday. This has brought the number of players at the team’s Savoy Hotel Resort and Spa to 18. As at Tuesday morning, there were 12 players in all: Henry Onyekuru, Kenneth Omeruo, Francis Uzoho, Semi Ajayi, Samuel Kalu, Wilfred Ndidi, Kelechi Iheanacho, Chidozie Awaziem, Kelechi Nwakali, Bryan Idowu, Simeon Nwankwo and Joel Obi. 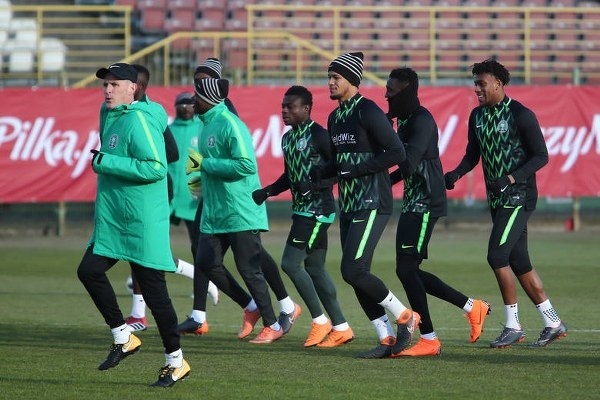 In the afternoon, Saudi Arabia-based Ahmed Musa, alongside Turkey–based Ogenyi Onazi, China-based Odion Ighalo, Germany–based Jamilu Collins and the England –based duo of Oghenekaro Etebo and Leon Balogun joined in. Goalkeepers Ikechukwu Ezenwa (from Nigeria) and Daniel Akpeyi (from South Africa) were being expected to arrive camp before dinner. The Super Eagles look to earn all three points against the Pirates on Saturday to restore their 2019 Africa Cup of Nations qualifying campaign back on track following a 2-0 defeat against South Africa in Uyo on Matchday 1 in June 2017.